Why is a Bearing Buddy® needed? Boat trailer hubs get warm while traveling to the ramp. Warm hubs backed into cool water during launching are suddenly cooled which contracts any air inside the hub creating a vacuum. The vacuum pulls water and raod grit inside the hub contaminating the grease. The contamination causes corrosion and rapid wear. Perfectly good bearings can be ruined in less than one season. Bearing Protectors corrects this problem by filling the entire hub with grease. Most air that is trapped inside the hub will be expelled by the Bearing Protector pressure relief feature. Once the hub is full, the spring loaded piston in the Bearing Protector exerts a slight pressure to the grease inside the hub. With the pressure inside the hub slightly higher than the pressure outside the hub, water and grit cannot be drawn inside. 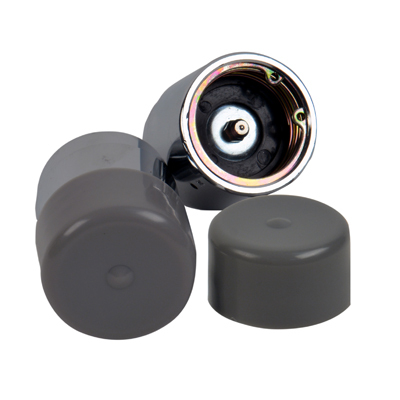 An automatic pressure relief feature precents over-filling the hub which would damage seals. Fits hubs with an inner diameter of 2.328"